So Christmas is around the corner! We already have family arriving and I'm so tired! I like to say "Less Is More" but that just doesn't apply at the holidays. It's more like what my girlfriend MJ, likes to say, "More Is More!" And I'm all on board! But as I settle in for the night, I try to find my quiet time to reflect for a brief moment on the meaning of the holiday. Even if your not religious its important to just reflect on what really matters in life. May all of you wishes be for others. May your days be full of good health. May someday your children grow up to fight the good fight. And give you many grandbabies to spoil. May the meaning of Christmas continue in you. May you wish Grace upon those you might not want to. And may God look upon you with many blessing. May you show those who are love ones what they mean to you. May your days be long and prosperous. Christmas is a holiday about people. All people, close and far. May you remember to be good to others and wish them the same wish I wish for you, for someday those lives you have touched will reflect a small piece of you. Hi guys! Welcome to our Home! So I have this great idea to make a red and blue dinning room for Christmas but I wasn't excited about anything I found. And my blue wasn't an easy blue to find. I had almost given up until I found IT! You know, the piece that inspires everything you do around it. And of course, I found it at HomeGoods. 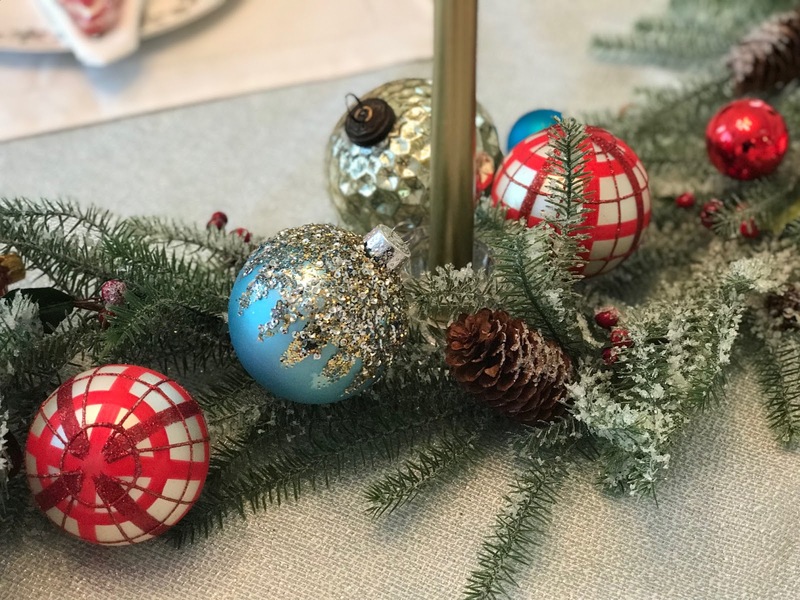 I found these adorable hand painted red and white plaid ornaments made in Holland. 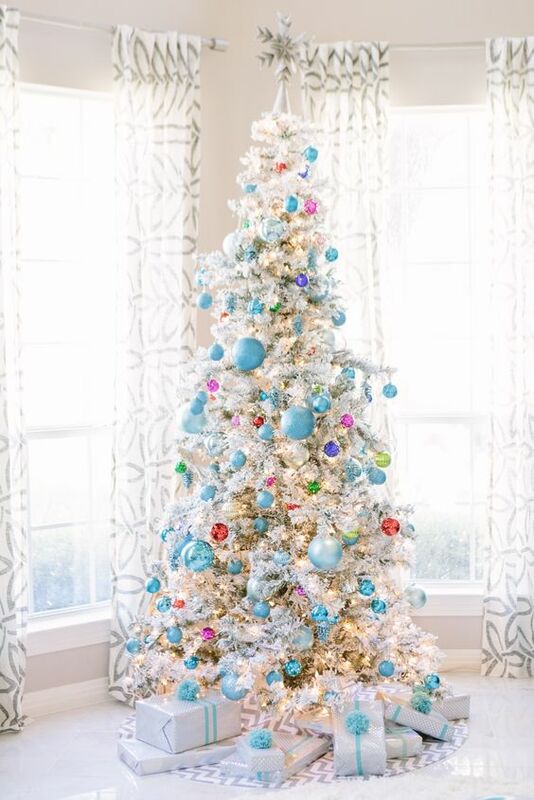 My next score was the blue ornaments with the silver glitter. They were just gorgeous. So I bought all that I could find in hopes it would be enough to decorated an entire dining room. I think it turned out pretty good! And it was so much fun. The colors really made me think outside the box. I found some lovely silver and red ornaments at Tuesday Morning that I threw in with the mix. I also found these cute snowflake ornaments at Michael's and just cut the string and tied them on. I really love how they look. They just add another dimension to the look. Elegant with rustic. Here is our big blue painting in the background. You might recognize it from our Thanksgiving photos. I love my painting but as you can see its quite large. So I usually try to tie it in someway with my decorations. Also, in this photo you can see that my Homegoods blue sparkle table cloth is just folded in half. I was wanting a large square tablecloth to layer with my red but I couldn't find the right size. I was planning to cut and sew it but alas, too much to do!!! Mix more expensive items with less expensive items. Not everything has to cost a fortune. Don't think you have to get everything at once. If I find something I love I buy it knowing I will collect other pieces to go with it in the coming years. Layer, Layer, Layer. I feel like you need three main layers minimum. I still believe in the real candles for the dining room table. I use good artificial candles elsewhere. Monogram napkins are one of my favorite ways to make my decor look rich and expensive. I definitely think they are worth the investment. 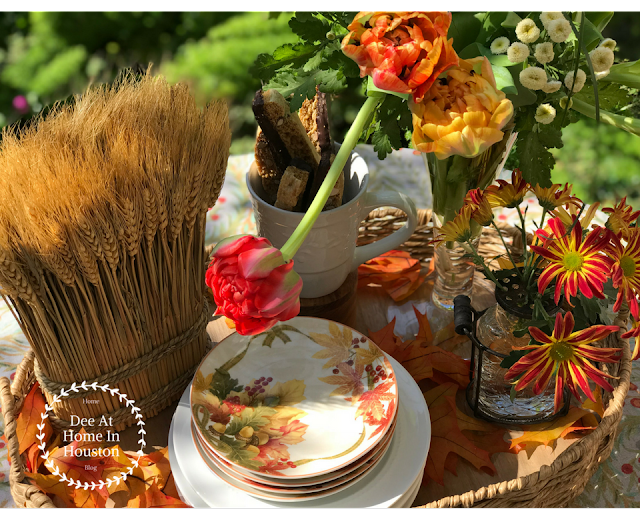 Real florals and greenery are the way to go most of the time but that can get costly or you just might not have the time to tend to them. 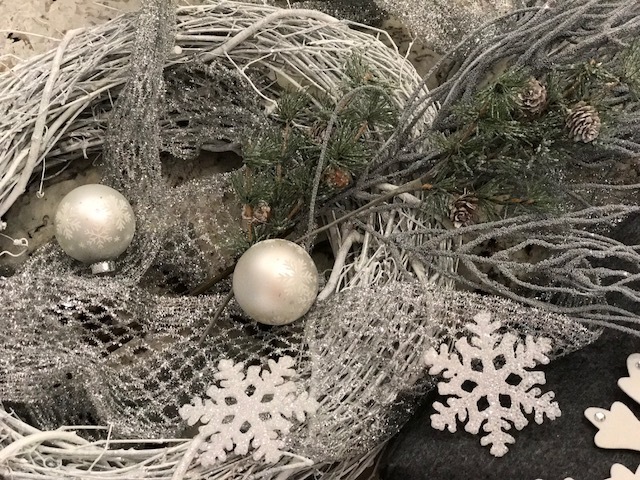 By buying good artificial greenery it lasts year after year. I almost never use china. I prefer to mix and mingle my good stuff with more casual stuff. I think this makes for a more welcoming setting. I don't want guest to sit down and be afraid to touch anything. Here I use my good silver and crystal glasses with these cute silver snowflake plates i found years ago at Marshalls and these red chargers from Michaels. The place mats are from Dillards. I found them on clearance for 2.50 a piece. Score! Did you notice my tree centerpiece in front of the mirror. 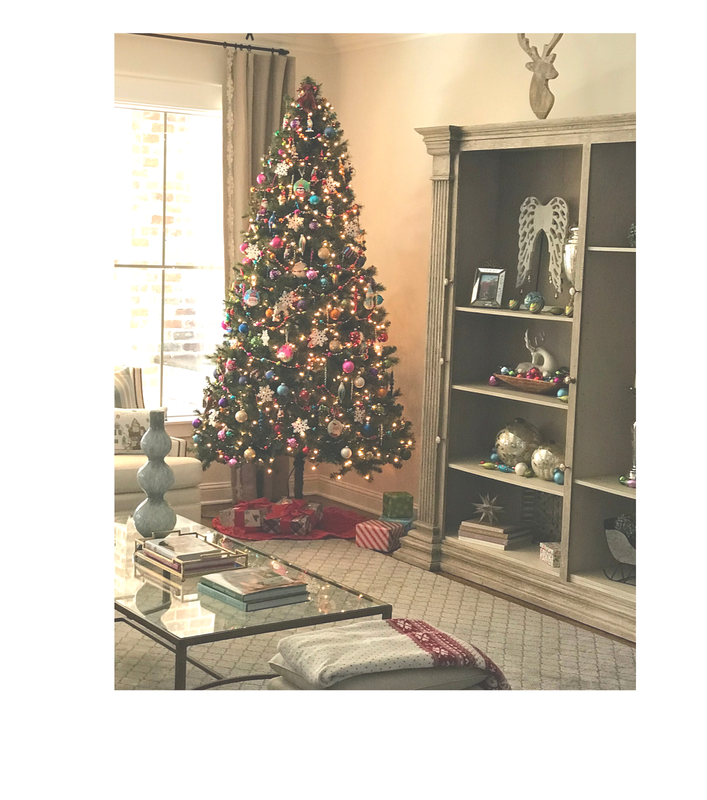 I could have easily gone with the traditional wreath over the mirror and a floral centerpiece, however, by using the tree it catches the eye because it is cute for one thing, but its unexpected! It totally makes people take a double take and say wow! I never would have thought of that! So for my little tree I was pretty much out of ornaments so I went on the hunt again. I found the perfect ornaments to compliment our blue and red Christmas theme. I found these cute vintage stripe ornaments at Michael's! I found a few other ornaments here and there and tied them on with a cute blue bow. I love how this turned out. I had some of the ornaments left over so I decide that they would be perfect as place card holders. But I needed a quick and easy solution . So all I did was glue plastic rings (you can find them in the sewing department) on the bottom for the base. Then, because I was running out of time I ditched all the complicated ideas floating around in my head for double side tape. I thought, why does this need to be complicated?!? I just bought name cards, and used double stick tape inside and secured the card on the ornament hook. Ridiculously easy! 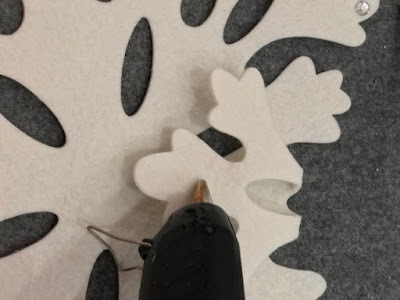 This is a super easy way to turn any ornament into a name place holder. So I'm keeping it short this time because I know everyone is in the Holiday rush. So I hope you found some ideas that will come in useful. And if you enjoyed this post I would love to hear your comments or any question you have at the bottom of this article. And if you would like to read more of my post just subscribe by adding your email in the black box on the right side of the screen. You can even follow me on Instagram, Pintrest. and Bloglovin. I'm so excited when I can share a quick and easy idea! And it doesn't get any quicker than this centerpiece. What I really love is how I can customize it to any color scheme. 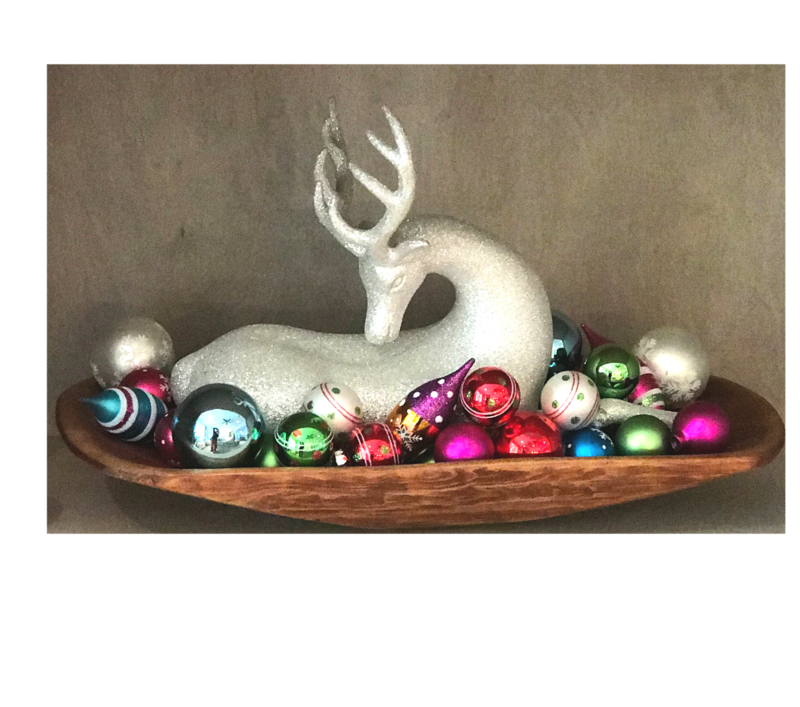 I found the glitzy deer at Michaels last year. You can get it this year here. I decided he would look great on one of the shelves on my new bookcase. Last year I used it as the centerpiece on my breakfast table. It's so versatile it will go just about anywhere! If you don't have a dough bowl you can find one at Ballard's Designs here. They are a little price but I promise they are a work horse. I use mine all year round. I also found a more budget friendly one on Houzz here. And if all else fails, shop around your kitchen. I bet you can find something that will work just as well! You can't get this wrong! And when Christmas is over I just store all of the ornaments together in a labeled box so I don't even have to think about it the next year. I just place the deer in and pour ornaments around it. No fuss, no muss, no bother. Christmas just the way I like it! 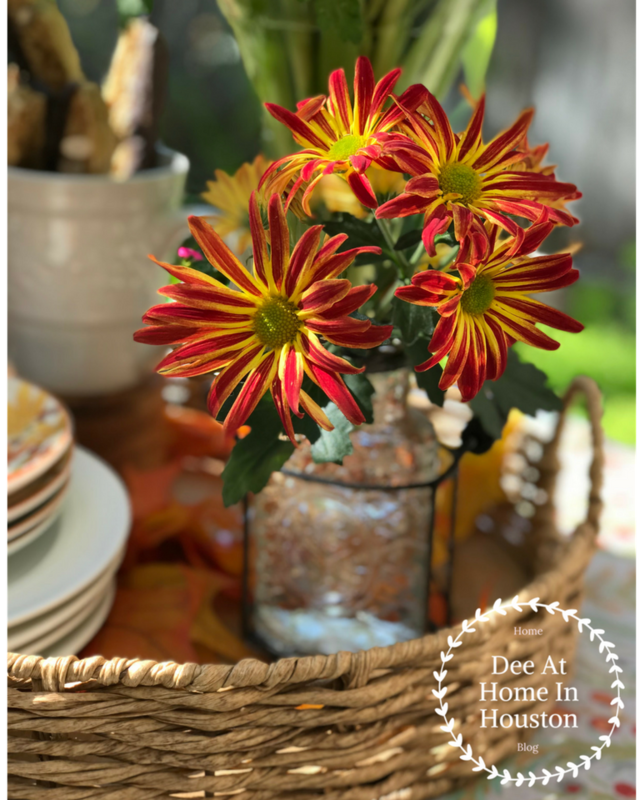 Do you have any easy centerpieces you love? I'd love to here you ideas ! Please leave a comment below and don't forget to follow me on Instagram, Pinterest and Bloglovin! Check out this cute purse I found for $7 at Target! I wasn't able to find a link online but I found it at the front with the dollar items. 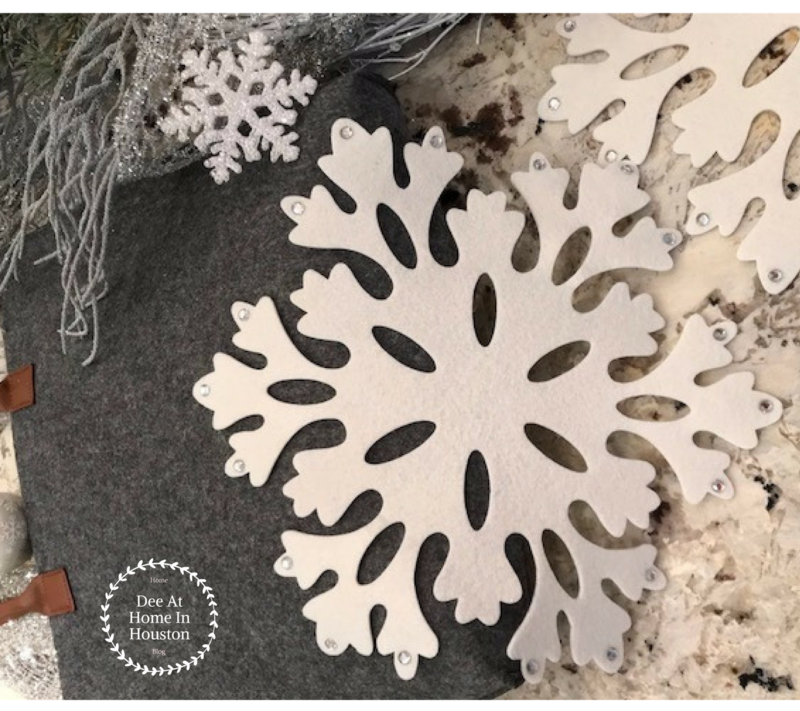 I thought,,, wouldn't that look adorable with a white snowflake on it? Pier 1 has these here for...wait for it...$2.37 each. SCORE. And since I was currently not loving my purse at the moment a snowflake purse for about $13 dollars sounded perfect. And because I'm lazy, I just hot glued the place mat on! I'm sure someone who is more experience than I would use fabric glue. I think it turned out really cute. What do you think? Not bad for a 10 minute project! I was inspired by these whites and silvers. How beautiful is heather grey with white and silver? I could do my whole house in this color scheme. 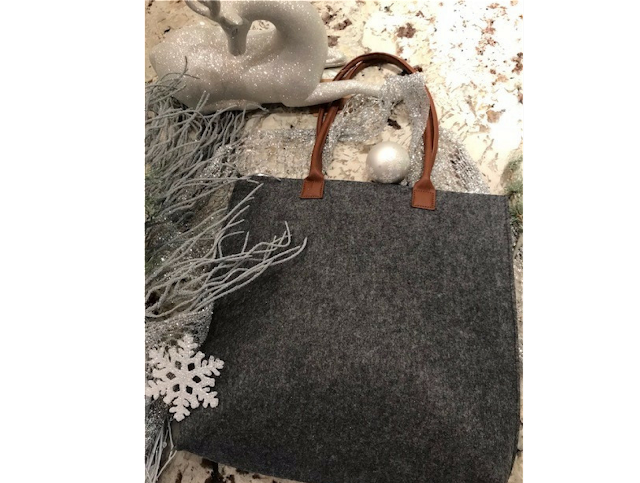 Since I made this purse last week I've received so many compliments! It's a big hit! Don't you love it when something inexpensive is better than anything else out there. I'd love to hear your ideas and comments. And please remember to subscribe by adding your email in the column to the right. Also, I'm on Instagram, bloglovin and Pintrest! So Today I went to my favorite Marshall's in Houston on West Grey. I thought I would give you some ideas of what that have for Christmas today! This is one of those great motorized cars! They had a couple or more. Boy and girl. Neat, I want one! So these are super nice and wonderful gifts for that man in your life! Or a family game room. Or that client you want to impress. They are collectors items so they are much nicer than the regular game. These photos don't do them justice! They are wood with storage drawers and some of them rotate. Very nice. They are more 3-D than the regular board games. 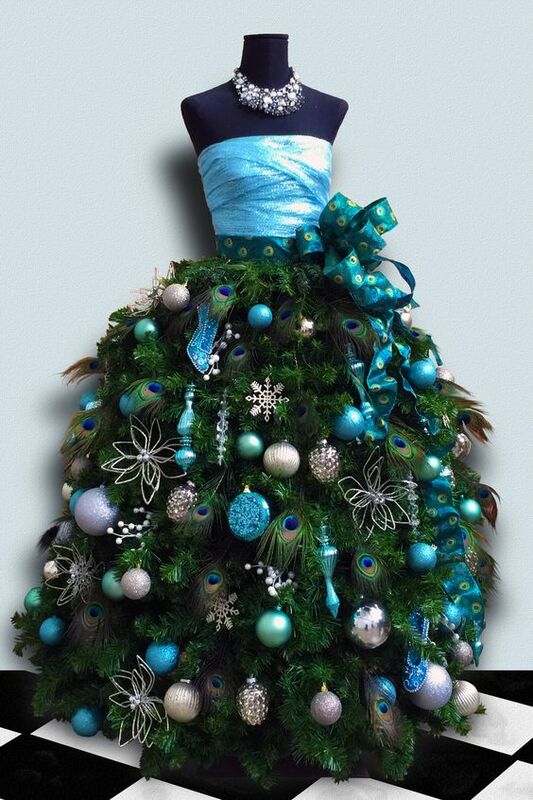 And, of course, the Christmas tree dress that is so popular right now. 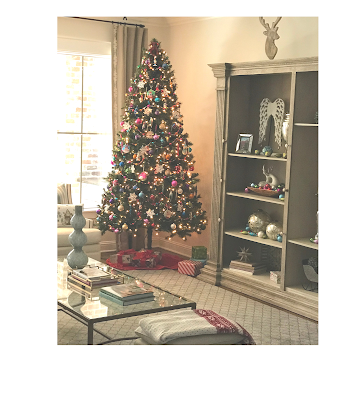 If you are looking for regular artificial trees they have some of those as well. Farmhouse is so big right now and I just couldn't pass up these old-fashion spools that have twine and ribbon on them. They are just beautiful in there own right! They have plenty of these. They are so pretty I don't know if I could actually bring myself to use the ribbon. Traditional colors only. And Coffee table books! I bought two for myself today! I can never have enough books. I think when you are making a home it should reflect who you are as a person/family. Coffee table books are a great way to do that. I have lots of interior design books, fashion/style books, and ancient history books around my house. They are all topics of interest for me and tell a person what I like with out a word! Happy Holidays! I hope everyone had a wonderful Thanksgiving. I'm assuming that everyone, like me, is already into the Christmas craze! I've been under the weather so my house is not coming along as quickly as I would like but I still have plenty of inspiration for you! 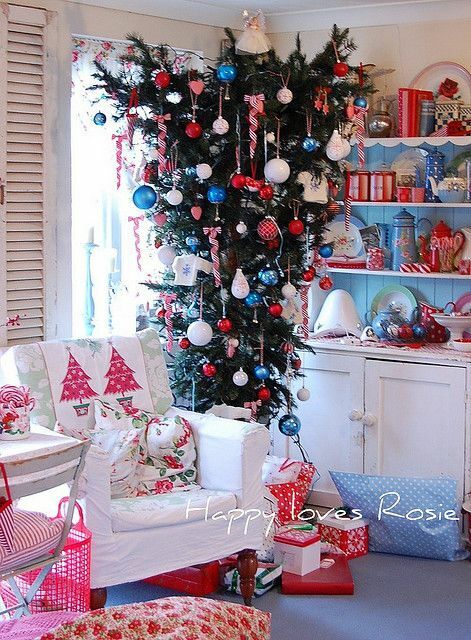 Who doesn't love a PVC pipe tree! Leave it to Martha Stewart to make PVC adorable! Upside down tree? Did I miss something? I think I missed the memo that this year we were hanging the tree from the ceiling. Well apparently, it's a very old tradition in Europe. Check out the interesting article I found here. So I have a confession, I act all sophisticated and grown up but deep down I'm still such a kid at heart. 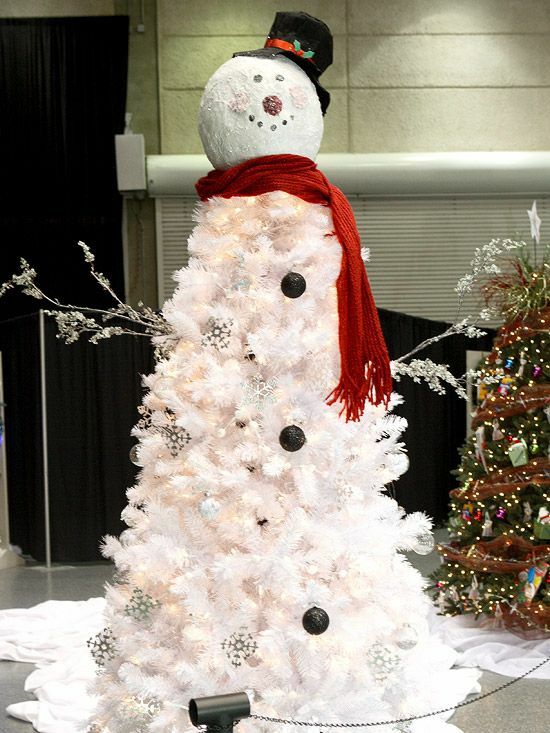 This might be my favorite Christmas tree EVER! 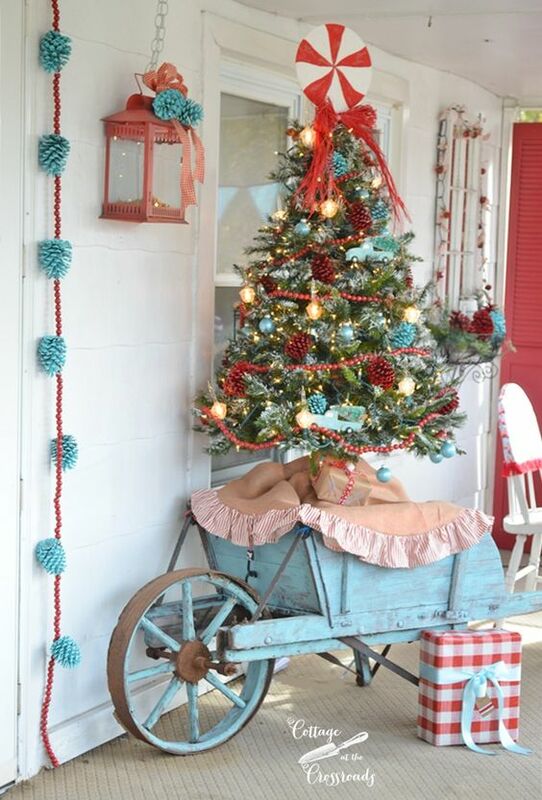 Can I just say my Christmas in the country was never this cute! I love the blue and red. Even blue pine cones! In Houston, Texas this is the closest we get to making a snowman! I thew this one in for fun. 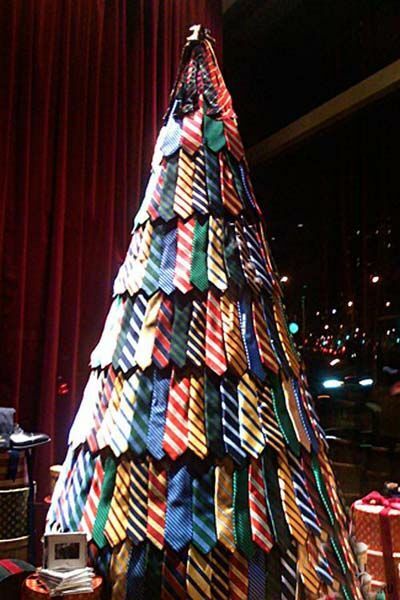 I'm pretty sure my husband has enough ties in the closet that I could easily do this!!! 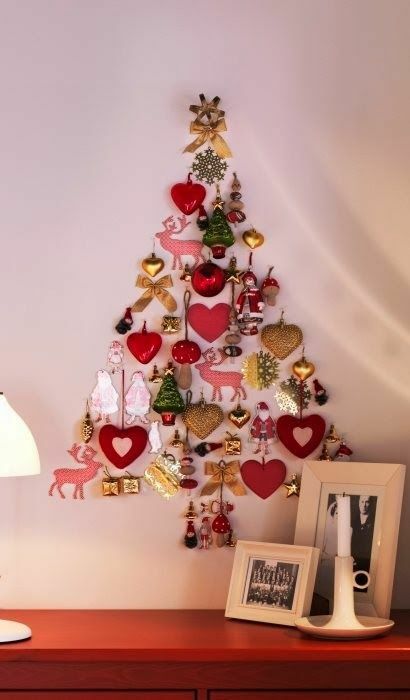 If you have a small space think UP, try fish line to make your tree come down from the chandelier or make use of your wall space! Think in non-traditional colors. Maybe work with the color palette that you already have in your home. If you can't find ornaments that are the right color you can make them. The craft stores have clear ornaments that you can pour paint into. The options are limitless! Think of items that you have a collection of. Are they stackable? Will they hang on a wall? Do you love books? Have book shelves? 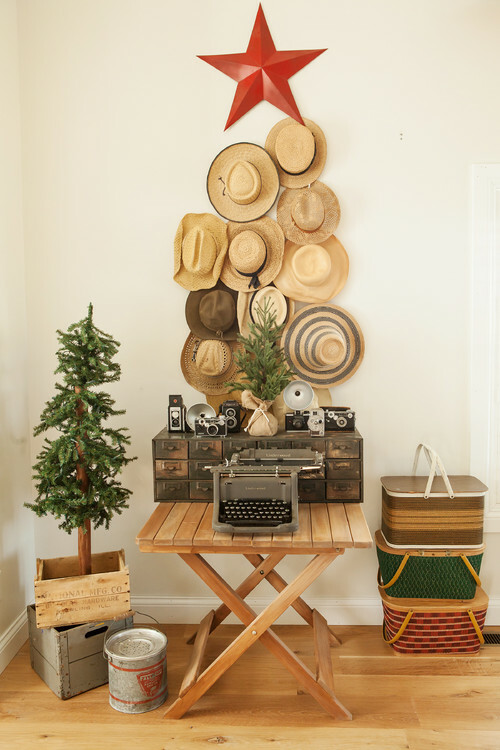 Create a tree out of arranging books on your shelves. 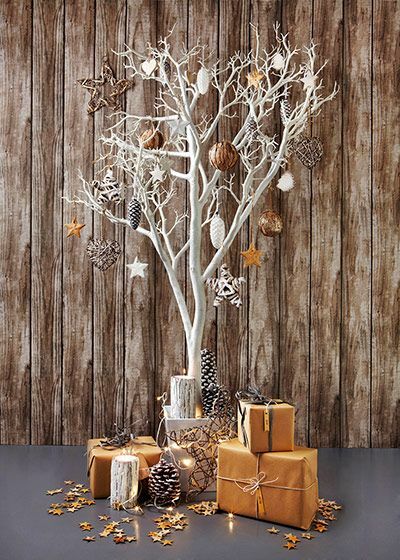 You can even cover them in wrapping paper to add a bit of color or keep them neutral for a more natural palette. 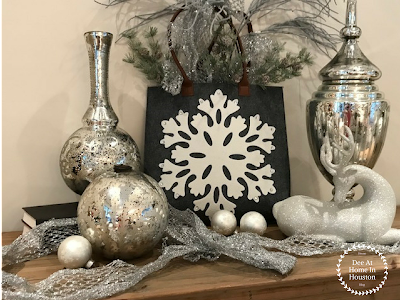 When you go run errands for the day, keep your eye out for anything that looks like it would work for your decor. Often times I stay away from the Christmas isles. It helps clear your mind. Walk through the hardware store and think Christmas Tree! Sometimes we have to force ourselves to see things in a different light. 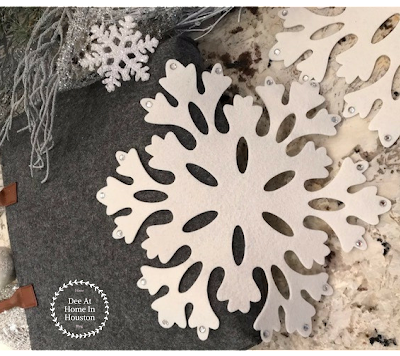 What about using cute drawer pulls to be the ornaments on a cut-out wood tree? What about a Christmas tree outside? Who says it needs to be inside? Don't get me wrong, I love the traditional red and green Christmas. But sometimes I just want a bit of a change. I personally love pink! So I've found a way to mix all of my traditional colors red and mix in a little of the fun colors too. 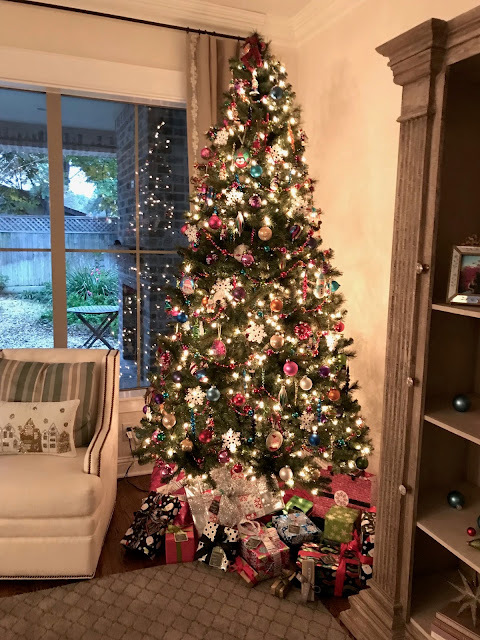 Check back in a couple of days to see my favorite Christmas Tree! I have a wonderful friend, MJ, who loves decor and entertaining as much as I do! Last week I was excited to be invited over for Friendsgiving. I love going over to her home. It's like a little French boutique. Every time I go over to her house I always find something new. I just couldn't wait to see what she had done for this special night! I wanted to share with you some of her beautiful decor. I am so envious that she just found this beautiful pheasant at a local antique store. Isn't this bird spectacular? I mean how lucky was she to find this peace? Anyway, MJ, added a few sprigs of seeded eucalyptus and some dusty miller and it's absolutely gorgeous. Another centerpiece I'm lusting over! MJ usually keeps real stag horns in a beautiful bowl on her coffee table. Here she has simply layered them with the same eucalyptus and dust miller. When I asked her where I could find some she replied that they were found at her ranch. At a small round table where you might not have room to place the silverware, stick them in a mason jar that matches the water glasses. The picture of casual elegance. Don't you just love how simple but elegant this table is? She makes it look so easy! I love how she alternates the napkins. With larger parties you might not have the enough matching place settings but MJ shows you how to make it work! I love it. I think it adds more visual interest. And the cute chargers? I think they have them at Michael's! Linen tablecloths were found at Marshalls. Beautiful napkin rings are Juliska. I think my favorite aspect of MJ sense of style is her ability to mix expensive pieces with less expensive pieces so you don't have to break the bank to entertain. With beautiful crystal goblets next to quaint mason jars it look fantastic. And the inexpensive chargers look great next to the fine linen napkins with Juliska napkin rings. Gosh, Thanksgiving is almost here! And I'm busy working on Christmas! Being new to the blogging community I haven't quite figured out how they do it all. It's not even Thanksgiving but everyone is already posting their Christmas homes decorated to the nines! I just feel like I'm running so far behind! Even when I went to the craft store the Christmas florals and ribbon were slim pickings! Well, I say its never too late for more inspiration! I usually have a large tray on my kitchen island with lots of goodies on it. But today is such a beautiful day I had to take it outside. 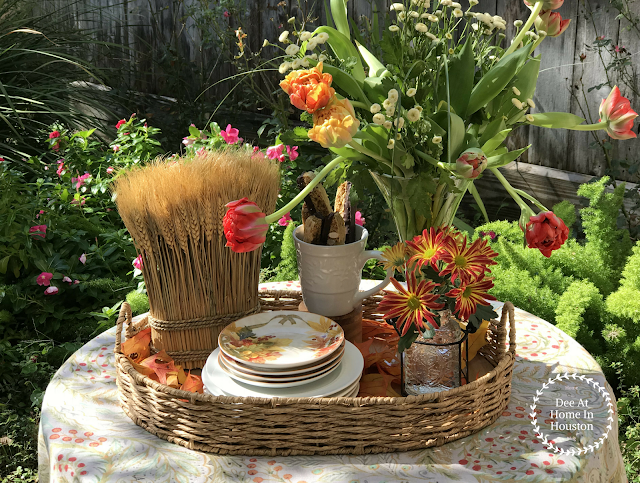 For fall, I picked up a tray at HomeGoods for about sixteen bucks. (If you have priced large trays you will know that's a pretty good deal.) 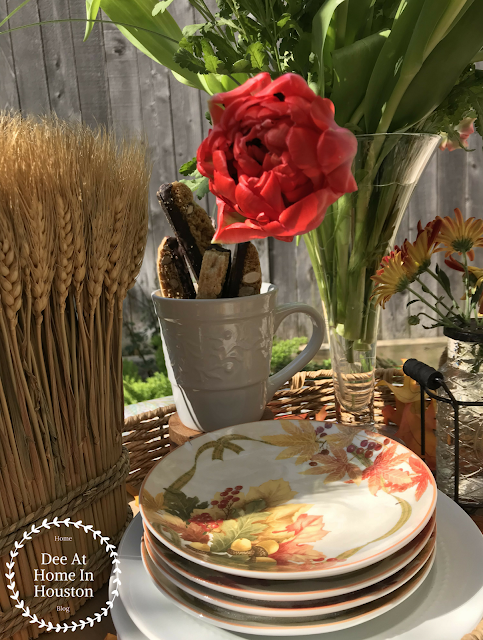 And, of course, the cute fall plates and the wheat stack are from HomeGoods too. (Because, really, who can go in that place without at least skimming every decor isle! Seriously, I need an intervention! They should have a warning like...If you have a problem with HomeGoods shopping and can't leave the store until you are running late to pick up your kids please call our 1-800-649-STOP number for help) Sorry, got a little carried away there...back to the vignette. You can't really tell from the photo but the bottom of the tray isn't very nice so I've used preserved oak leaves to disguise it while adding another layer to the design. You can use a cute cloth napkin to drape over the bottom of a tray too. I've stacked my bisscotti and mug on an acacia salt cellar. You can find one here. If you like this tray vignette and would like more ideas I suggest checking out Yvonne at StoneGable. See her fall kitchen vignette here. I learned so much from her blog! In my mind, no tray can be created without some fresh flowers on it. As for which flowers to use? Well, I can use tulips for any season! They are so beautiful and come in so many colors. I just added a cute little daisy filler (sorry, don't remember the name) and my amazing floral piece was done. 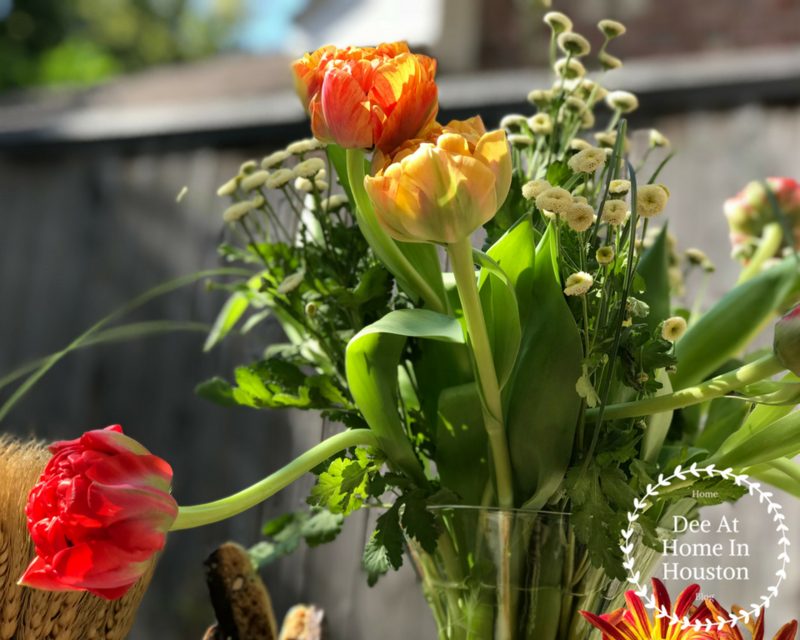 Tip: Tulips can open fairly quickly when they are warm. In Houston it's always warm! When I have company coming, I buy mine when I go to the grocery store and stick them in a short round vase that fits into the refrigerator nicely. When I'm ready for them to bloom (when company is coming over) I take them out of the fridge a day or two before. I've also been known to put them back in the fridge overnight and set them out again in the morning. You will be surprised at home much longer they will last! Next time you buy tulips try it! I found this cute little farmhouse vase at Hobby Lobby. Remember the chrysanthemum arrangement I made here? Well, I just went and cut off a piece from the back of the plant and there you go... Lovely.